Of course we’ve all heard about the many benefits from instance leveling, but one aspect that’s easy to overlook is how easy it is to farm for gold while you’re leveling. There are several different ways to make plenty of WoW gold while you’re instance leveling, but you have to know how to work the auction house and be able to recognize what will make you WoW gold, and what won’t. One thing you’ll see plenty of while you’re instance leveling is cloth. You’ll leave all of the lower level instances with about one stack of cloth, which is valuable in so many ways. First of all, it prevents you from having to purchase any cloth to level your First Aid profession. You’ll have so much cloth that you will be able to level First Aid and still have plenty of cloth left over to sell. Tailors will also love how much cloth they will have, and instance leveling can certainly cut down on how much cloth they need to purchase, providing a valuable savings in WoW gold. One thing to keep in mind for those who aren’t leveling First Aid or Tailoring is the fact that those stacks of cloth can be worth a lot of gold on the auction house. As the Cataclysm expansion approaches, more and more players are switching one of their professions to Tailoring. This is because of a major change that’s coming in the expansion that will allow them to alter certain specs on certain pieces of gear. It will be a valuable skill that tailors will be able to sell to other players when Cataclysm rolls around, and it’s the reason so many WoW players are leveling Tailoring right now. This means cloth is in demand, which should drive the price of cloth on the auction house up. 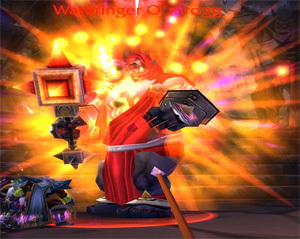 Another important way to farm for gold by instance leveling is through enchanting materials. Most of the time you will have an enchanter in your group, and you’ll know if you do because the “disenchant” option on the loot bar will be available when everyone is rolling on gear drops. Always choose “disenchant” if you don’t plan on using the gear. This will allow you to roll on the materials that come from disenchanting the item, allowing you to take advantage of the enchanter’s skill to disenchant items. Enchanting materials will always sell for top dollar on the auction house, so make sure you save up stacks of them to sell as you’re instance leveling. Instance leveling also gives you more opportunities to roll on other rare items that can be used for various professions. The trick with these items is being able to recognize which ones are worth gold on the auction house. In general, items that appear with a white name can be sold on the auction house because someone can use them for a profession. However, part of this is going to be trial and error. If these items repeatedly do not sell, then you’re better off selling them to a vendor.